Alabama QB Tua Tagovailoa's play is inspired by a single word -- Ohana -- which in his world, dictates a way of life. Alabama's offense is having a record-setting season, in part due to the improvisational skills of quarterback Tua Tagovailoa. 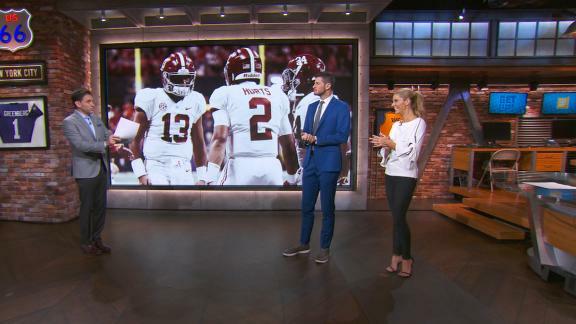 Tim Tebow says Jalen Hurts is the second-best quarterback in the SEC and Alabama should replace Tua Tagovailoa vs. Tennessee if his knee stiffens. Greg McElroy says Alabama QB Tua Tagovailoa shouldn't start Saturday against Tennessee unless he is 100 percent. Tua Tagovailoa throws a dart to WR Jerry Jeudy for an 81-yard touchdown, putting Alabama up 7-0 early. Alabama coach Nick Saban confirms that Tua Tagovailoa will start, but the team will still use Jalen Hurts. Saban then compares managing the QB situation to raising children. Jalen Hurts and Tua Tagovailoa showcase their signature handshake before Alabama's matchup with Louisville. Desmond Howard explains how Nick Saban is trying to appease both Jalen Hurts and Tua Tagovailoa. Tim Tebow thinks Alabama can use Jalen Hurts and Tua Tagovailoa, but Nick Saban will need to decide who he trusts more. From a bevy of one-handed grabs to end-zone flips to Alabama's breathtaking championship winner, relive the excitement of last season. Alabama QB Tua Tagovailoa describes missing spring camp as frustrating, but says it gave him time to sharpen up mentally. Who will win Alabama QB battle? The Get Up! crew debate who they think will win the starting QB job at Alabama between Jalen Hurts and Tua Tagovailoa. Running backs Bryce Love and Jonathan Taylor join a trio of quarterbacks who are the leading contenders for the Heisman Trophy.